The C11 nave has pilaster-strips, though most other detail is later. 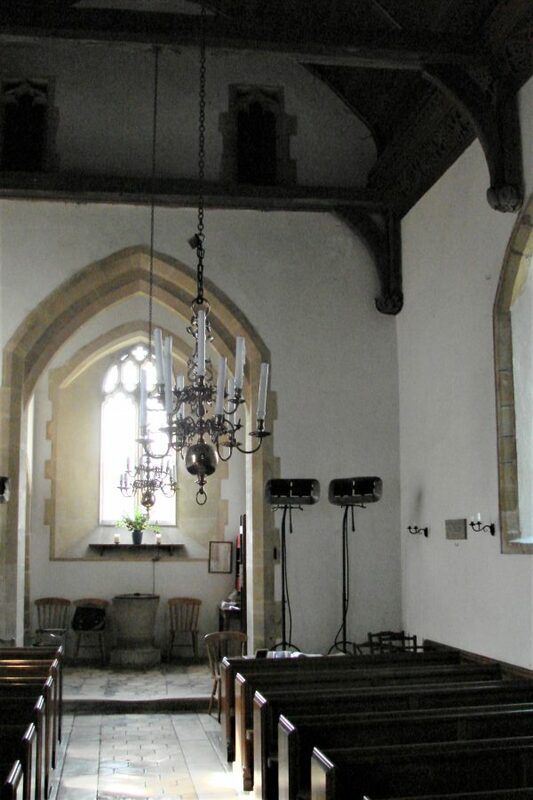 The tower dates probably from 1728 and the chancel is C19. There is some fine C16 Flemish or German glass. Woolbeding is on the Western Rother, close to Midhurst. The church stands near a few houses and adjacent to Woolbeding House, a fine stone building of c1700. 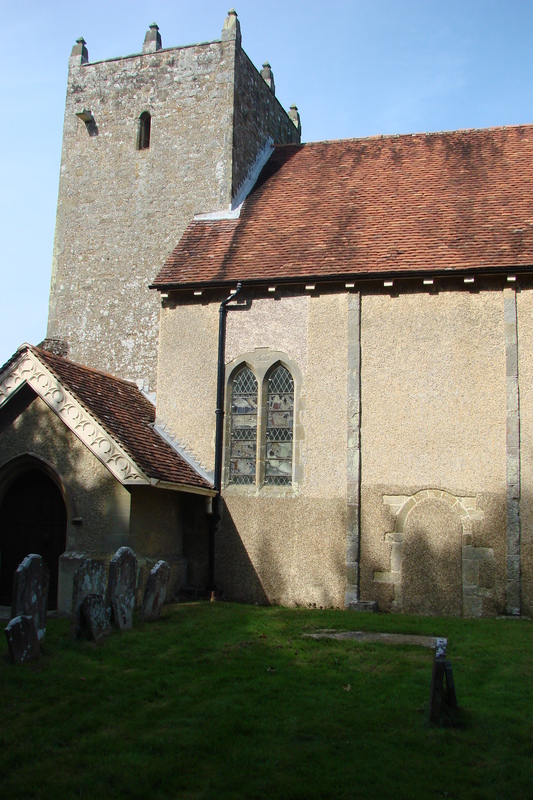 It is mentioned in Domesday Book (14, 1) and as the tall nave looks mid-C11, this may be regarded as the same structure. It has regularly spaced strip-pilasters on both sides (some are missing to the north) that stand out from the rendered remainder. The jambs of a blocked south doorway found in 1980 (vidi) have long and short work, but this is the only other remaining detail. Its proportions are relatively broad for the mid-C11 and John Potter suggests it has been altered (SAC 145 (2007) p91), though he offers no evidence. A suggestion in Parsons and Milner-Gulland (p115) that the doorway was a later insertion comes up against the presumption that a south doorway would have been present from the first. Rodwell (The Archaeology of Churches, 2005 p87) notes this as an instance where the main entrance to the church has been moved towards the west. In addition to this doorway, there is also said to have been a plain round-headed one in the tower until 1870, which could have been a reset C11 one, as the VCH suggests (4 p86). There was originally a wooden belfry and it is uncertain if there was a chancel arch, though a plan with the restoration papers of 1876 (WSRO Par 216/4/1) shows one with two chamfered orders, the inner on corbels. If this is correct, it looks C13 and its form provides further support for this as the most likely date of the mediaeval chancel. The same plan shows paired lancets in the nave, as today. Though they do not now look old, they probably follow C13 ones. The nave roof with braced crownposts may be of that period and so may the flat, shouldered rere-arch of the south doorway. The Sharpe Collection drawing (1804) shows a two-light pointed north window in the nave that could be mediaeval, which does not survive. Nothing else is older than the C18 with round-headed windows of this date in the nave and chancel, as Adelaide Tracy (1848) (I p43) shows. According to the 1876 records, the then chancel had been rebuilt relatively recently and it may have dated from 1728, which is the date on a plaque on the west tower and marks its construction at a cost of £74 2s (Parsons and Milner-Gulland p116). This plaque is now below a row of initials of members of the Mill family, lords of the manor. This may have come from elsewhere, but the date is stylistically plausible. The Sharpe drawing shows it was originally plain with low diagonal buttresses and small round-headed north and west windows, the latter double, as well as the west doorway already mentioned. The top has never been altered, with a parapet and tiny pinnacles. Work in the C19 is not fully researched, though the plans of 1876 are a good source. No signature can be deciphered for the only one is illegible and may be the Bishop’s. There was previously no tower arch and one was provided after a west gallery was removed and the nave roof boarded and given heavy wallplates, carved with foliage. Two cusped openings above belong to the work. 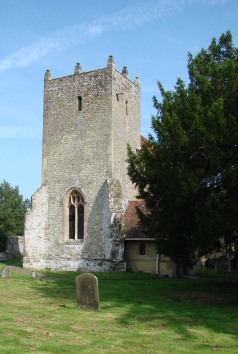 The lower part of the tower was made to appear more mediaeval outside with a two-light west window of panelled tracery and a porch was added on its south side. Lord Laverton, lord of the manor paid for this restoration, but as so often with private donors, records are sparse. 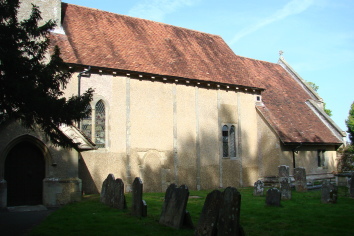 The church was not re-opened until 1880 (CDK 1881 pt 2 p161), with a new chancel, rather larger than its predecessor, and a north vestry. The broad chancel arch probably belongs with it. There is a reference to work by R J Johnson in 1890 (BN 58 p720), but the nature of this, coming so soon after the extensive work of 1876-80, is not known. It could even suggest he was the architect in 1876-80. Altar rails: C18 mahogany with turned balusters. Capital: (Formerly in chancel) This was of the cushion type, i e probably C11, and very worn, but its provenance is unknown and it is thought to be from an item of church furnishing (www.crsbi.ac.uk retrieved 22/4/2013). Chandeliers: (Nave) Good C18 work, relatively small. Commandments etc: (South chancel) Probably C18. Font: Plain tub with tapered sides, probably C12, similar to others in the Western Rother valley. 1. 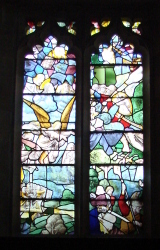 (North chancel window and nave south west window) C16 Flemish or German, with scenes from the Passion. 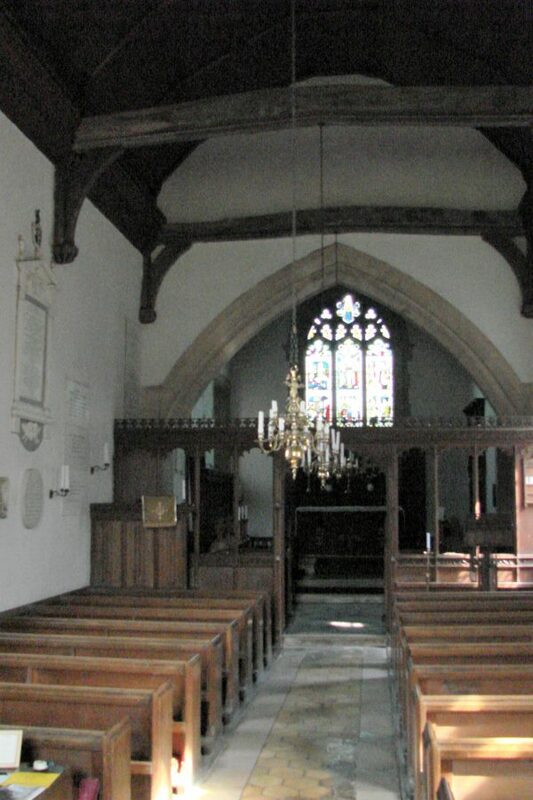 It was brought here in the C18 from Mottisfont priory, Hampshire (Horsfield II p101) by Sir Henry Mill, the rector and until 1876 was in the east window. The scenes are incomplete and incorrectly assembled. 2. 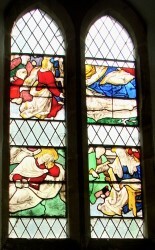 (East window) C E Kempe, 1880. 1. (South nave, adjacent) Margaret Mill (d1744) and Sir Richard Mill (d1760). The former consists of a white marble inscription under a broken pediment and the other is made of multi-coloured marble with a flat top. 3. John Dodsworth (d1773) (Outside, against churchyard wall) Two Doric columns supporting a flat canopy with a frieze of military trophies. The inscription is lost. Pulpit: Carved by J E Knox, together with the nave pews, 1880 (CDK 1881 pt 2 p161). Recess: (In blocking of south doorway) Of unknown date and purpose. 1. (On chancel south wall) Plain C18 with Creed, Commandments and Lord’s Prayer. 2. (Chancel) Carved by J E Knox, 1880 (ibid).